An independent travel guide to Halong Bay with candid reviews and recommendations. No sponsored content, no advertorial. Kayaking is under a cloud right now. Was stopped and then resumed. Floating village excursions - these are rare now. Cave visits are standard on all Haiong Bay cruises. Halong in winter - still beautiful. Halong Bay’s 2000 limestone islets, soar from a deep emerald sea, creating one of Asia’s most spectacular landscapes. And the word is out. Over the past few years, the number of tourists heading to the bay has skyrocketed. Steeped in myth, the name ha long, translates as “descending dragon”. Vietnamese legend holds that the bay’s islets were created by a descending dragon’s lashing tail. For practical information on travel to Halong Bay, head straight to this guide. Halong Bay first found modern-day international fame in the early 1990s French film, Indochine. The film that tells of colonial exploitation, is still worth a look. And it reintroduced Halong's wonders, as a reforming Vietnam threw its arms open to world. The French were the drivers of Vietnam's first mini-tourism boom and Halong Bay and Indochine played their part. Tourism to the bay received another boost with a World Heritage listing in 1994, and again with a 2015 screen appearance in Kong: Skull Island - the latest King Kong flick. These days, few Vietnam itineraries overlook Halong Bay. In recent years the bay has become a victim of its own success. Overcrowding and poor management by local authorities has seen a number of incidents - sinking boats, burning boats - some of which resulted in fatalities. 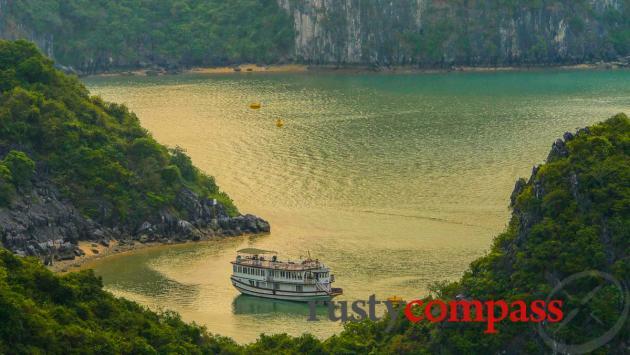 Big crowds have forced a dumbing down of Halong tours. Swimming is no longer permitted in the bay. Floating fishing villages have been relocated. Kayaking is periodically forbidden - it was during my most recent visit in May 2017. Cave visits seem to be the only dependable inclusion. Had some fun shooting this with friend Kit on the bay - our little tourism promotion. Scamming is rife too -both on the internet and among tour sellers on Hanoi's streets. Choose your tour carefully. Buy from someone you trust. Halong Bay may be changing, but it's still Vietnam's iconic natural wonder. Few travellers regret visiting. Most rank it a highlight. The last decade has seen a big increase in the number of travellers staying on the bay in an assortment of craft, for a night or two. The best of these are very comfortable - the worst provide mediocre and often unsafe conditions for budget travellers. Day trips from Hanoi are still the most popular way to visit. Once again - shop carefully. It's a pretty intense day - but you'll still get some good views of the bay. Those staying on the bay overnight enjoy the beauty of the Halong sunset and sunrise. In good weather (best months are from March to October though storms are common in summer months), it’s an unforgettable experience. In winter (December to February), the risks of cold weather and low visibility increases. Even in the mist though, Halong Bay has a beguiling lure. In 2017, there are indications that Haiphong may be finally about to challenge Halong as a centre of boat cruising on the bay. The large port city is preparing to become a major access point for tourism. Cat Ba Island has been popular with budget travellers for years. The current players could definitely do with some competitiion - especially if it raises environmental standards and variety. We’ll keep an eye out for developments in Haiphong. 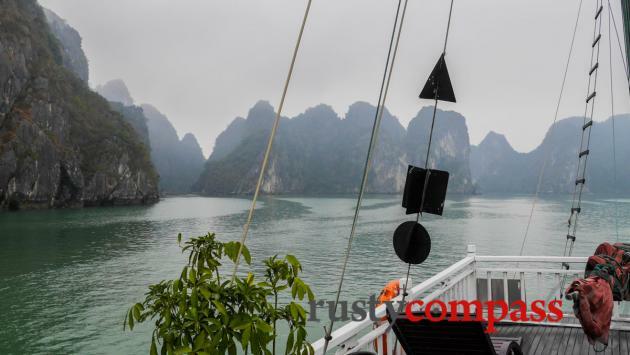 The weather will have a big impact on your experience of Halong Bay. It's spectacular both in the atmospheric mist of a cold winter’s day and the clear skies of summer - but the experience will be very different. You may be less inclined to spend a night on a boat in winter. It’s also worth noting that cruises are frequently cancelled during severe weather - which is most likely to occur between July and October. In recent years, Halong Bay has been plagued by safety incidents - including sinking and burning boats. Some of these have resulted in loss of life. More rigourous safety standards have been implemented ,though safety compliance and enforcement issues are rife in Vietnam and seem especially poor at the bay. While there are strong indications that standards have improved, travellers should be careful in selecting a company that demonstrates an awareness of safety. 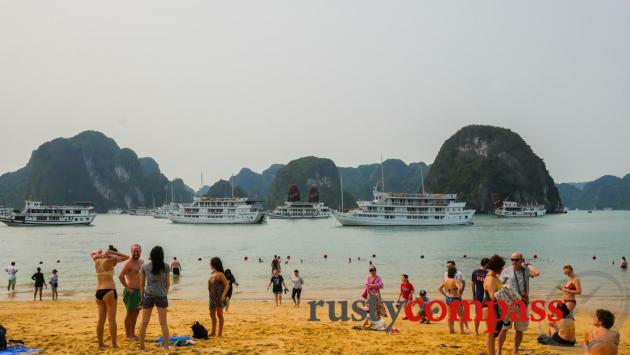 The upsurge in tourist arrivals and coal mining in Quang Ninh province have all impacted Halong Bay's natural environment. We are advised that tourist boats spew untreated sewage into the bay. Visual pollution like plastic and polystyrene will also be visible in places. Much has been written and said about environmental standards in the bay however there is little information available in English that would indicate serious measures to protect the bay's marine environment. Halong Bay attracts more than its fair share of scammers. Dodgy tour operators sell dodgy tours out of Hanoi - often purporting to book a reputable cruise company. 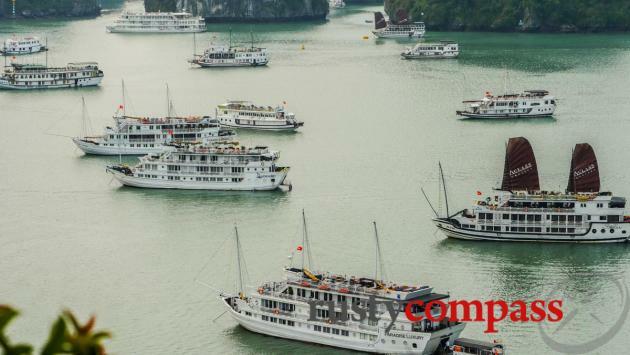 Scammers have also set up fake websites using the names of reputable Halong Bay cruise operators. Exercise care when making bookings.